The Navy was all set to roll out its upgraded spy drone, a 44-foot behemoth. Then one of its Global Hawks crashed into an eastern Maryland marsh on Monday. It's the latest setback for the Navy's robotic aircraft. An unarmed RQ-4A Global Hawk went down during a training exercise near the Naval aviation base at Patuxent River, Md. on Monday, CNN reports. Local news has footage of the wreckage. No one was hurt except the Navy's pride. But ouch, that pride. As AOL Defense reports, Thursday marks the debut of a new pimped-out Global Hawk at Pax River, as part of the Navy's newest iteration of its Broad Area Maritime Surveillance Program. BAMS, as it's known, uses a Global Hawk outfitted with Navy-specific sensors to spy on a whole lot of ocean and beach. In this case, the Navy was set to debut two new, powerful 360-degree radars aboard its Global Hawks, with range in the hundreds of miles, as part of a $1.16 billion contract signed in 2008. It's unclear if the Global Hawk that crashed was actually carrying the new radars. Even if it wasn't, the drone programs run by Naval aviation look increasingly star-crossed. In April, technical glitches forced the Navy to ground its robotic Fire Scout helicopters despite praising their performance in counternarcotics operations to the high heavens. Then the Navy decided to spend another quarter billion dollars on an upgrade. A more ambitious Navy drone program would, for the first time, allow an armed drone to take off and land from the deck of an aircraft carrier. But the so-called X-47B won't be ready until 2018 at the earliest. For now, the stealthy, batwing-shaped robot makes people who see it fear an alien invasion. Don't ask about drone submarines, since they're an immature technology. 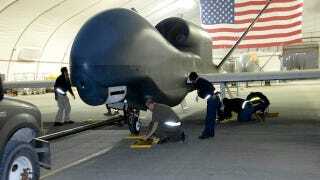 Drones crash, and however embarrassing this current crash is, the Global Hawk is a robotic workhorse. But it didn't take long for the Twitter-borne drone watcher @drunkenpredator to rechristen BAMS "Bits of Aircraft in Maryland Soil."